So it's important to address these problems by cleaning, decontaminating, and restoring the attic to its original state. This is done through several steps. 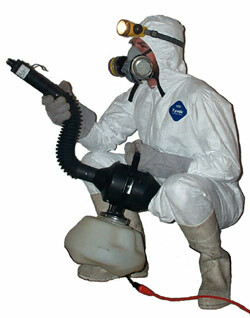 The proper training and equipment is required, such as a HEPA filter mask and biohazard suit, as seen to the right. Attic restoration can be quick and cheap, or intensive and expensive, depending on the amount that needs to be cleaned. Homeowner's insurance may cover the cost. Step 1: Vacuum the Droppings: The droppings of smaller animals, such as rats, mice, squirrels, birds, and bats cannot be efficiently or even realistically removed by hand. These droppings are usually in the form of thousands of small pellets spread throughout the attic, on or in the insulation, and on many surfaces, such as this duct seen in the photograph to the left. These droppings must be vacuumed out with a filter vacuum. If the droppings are spread throughout the insulation in high concentration, that insulation should be removed and replaced. In such a case, a huge high-powered insulation vacuum device, with a giant hose running outside, is best. But for many cases of lighter infestation, a smaller vacuum will do the job. Step 2: Removal of Large Animal Droppings: The large droppings and other debris left behind by the animals must be removed by hand, because a vacuum is not powerful enough to remove these larger items. Bigger critters, such as raccoons and opossums, leave very large droppings throughout the attic, such as in this photo of possum poop seen to the right. It's important, when handling any wild animal feces, to properly protect yourself against infectious disease by wearing the proper safety equipment, such as rubber gloves, biohazard suit, and HEPA filter mask, to avoid breathing in airborne pathogens, such as raccoon roundworm eggs, which can be inhaled and infect humans. Nesting material should also be removed - squirrels, raccoons, and other animals can bring in sticks and leaves and other nesting material, which are often full of parasites. Step 3: Attic Fogging: This is probably the most important step. Although a great effort is made to remove as much of the waste as possible, a great deal is left behind. Not just waste, but oils and grease from the animal's fur, pheromone attractants left behind, parasites such as fleas and ticks, and urine that has dried out. Plus the mold that grows on areas of waste. The attic is fogged via a special electric-powered atomizing mist machine, which dispenses the special enzyme-based biohazard cleaner. This special cleaner destroys organic matter specifically, without affecting the structure. It kills the pathogens and breaks down urine, grease, and animal poop, effectively "digesting" it with time. It renders the waste inert, and importantly, eliminates the pheromone odor left behind by the animals. It's very important to get rid of the animal smell, because the scent of animals living in an area can attract new animals of the same kind, or even predator animals. Some companies offer full-blown restoration via the complete removal of all insulation in the attic, and replacement with new insulation. 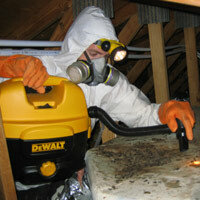 This requires special attic restoration and re-insulation equipment. In cases of extreme damage or soilage, complete insulation replacement might be a good idea. And it's often covered by homeowner's insurance. 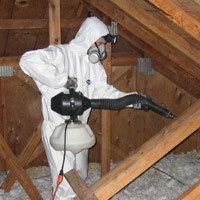 To read more about the process, please click my Attic Insulation Replacement page. I have compiled various photographs of wildlife excrement, in case you need to perform identification. Click these pages to learn more about: rat poop, squirrel poop, possum poop, raccoon poop, bat guano. If you need attic restoration in your hometown, click my Directory of Thousands of Wildlife And Attic Restoration Companies.